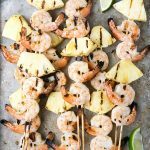 With fall settling in and busy food holidays upcoming, using a grill to off load some of the key cooking solves a space issue and offers a unique twist on a classic dessert. 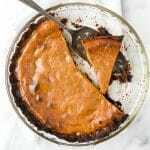 Grilled Pumpkin Pie with Hickory-Smoked Ginger Snap Crust is made fully on the grill and will be a great addition to your cool weather dinner table! Happy first day of Fall! Though in my routine, fall mentally begins after Labor Day, the official calendar proclaims today to mark the seasonal change. 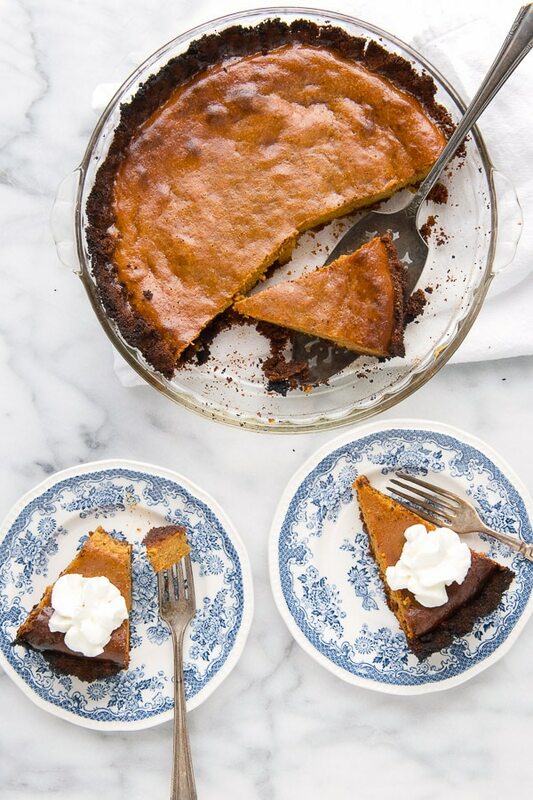 Feeling that is always best done with food I have a fun summer-meets-fall recipe to share: Grilled Pumpkin Pie with Hickory-Smoked Ginger Snap Crust. For weekend grillers, meat and vegetables are generally the primary things that come to mind when firing up the charcoal. I learned last year that is the short list and really almost everything that can be cooked in a traditional oven or on a stove top can be considered for the grill. I had the good fortune to meet Steven Raichlen, (author, grilling luminary and TV show chef) last summer when I attended his BBQ University in Colorado Springs, Colorado. I attended BBQU with the goal of upping my grilling game both for personal and professional reasons. I was at BBQU about 2.4 nanoseconds before I realized I actually had NO grilling game; I simply knew how to grill hot dogs and sausages without burning them. In the following 3 days the world of grilling and smoking ripped wide open for me. There was almost more information than I could take in, and suffice it to say I walked away with a vast array of techniques and knowledge to jump into my own experimentation. Following BBQU I grilled daily during the summer and began to experiment with smoking, food, (being from Colorado a clarifying noun after the word ‘smoking’ is key). While other girls I know are coveting the latest fashions, I’m pining over a new barrel smoker and wondering how many grilling devices would be considered ‘too many’ to own. I tend to like culinary roads less traveled so love thinking up unexpected recipes for the grill. Being fall, with busy cooking holidays looming large, I wanted to share a way I’ve been using the grill to keep my oven free for other purposes: Pumpkin Pie on the grill with Hickory-Smoked Ginger Snap Crust. All of the cooking happens on the grill itself and the recipe steps are simple. 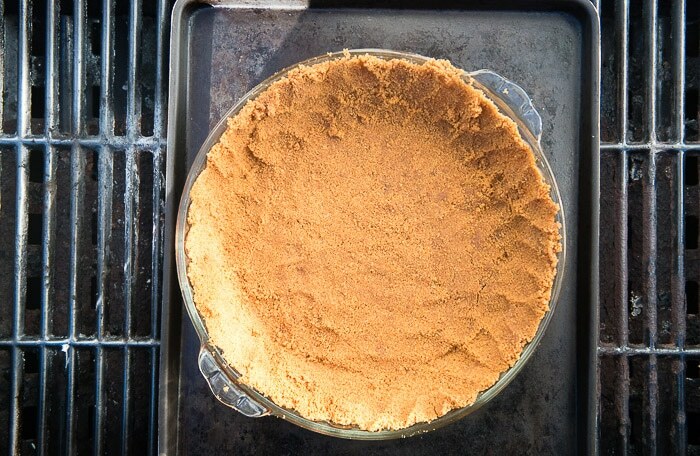 The initial step of smoking the ginger snaps gives an additional depth of flavor to the pie, setting it apart as a unique dessert. I used a very easy method of dry wood chips on heavy duty foil for this short smoking. This leaves the grill ready to transition to cooking the pie crust and then the pie, without the difficulty of removing hot wood chips from charcoal or a smoking box. I will admit as I was creating the recipe I did hear Steven in my head asking, “why don’t you grill that pumpkin? 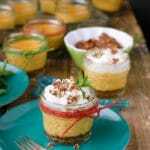 !” It did cross my mind however in the spirit of keeping things simple I used prepared pumpkin puree. Sugar pumpkin slices could be lightly oiled, sprinkled with fall spices and grilled until soft enough to process through a food processor for the pumpkin puree as well. Cooking a pumpkin pie on a grill allows saving kitchen oven space and incoproating new flavors into a classic fall dessert. An easy smoking of ginger snap cookies before making them into a pie crust adds a smoky flavor which perfectly complements the sweet pumpkin filling.Finish with a scoop of ice cream or whipping cream! With the grill set up for indirect grilling with medium heat (350 degrees), place the hickory wood chips on a small piece of heavy duty foil (on the heated side of the grill). 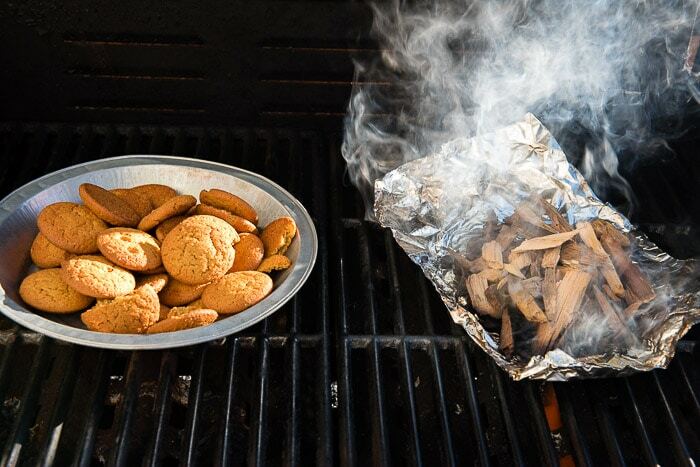 Once the wood chips begin to smoke place the ginger snaps in a heatproof pan on the non-fire side of the grill. Allow to smoke for 10 minutes with the lid on/down; remove and allow to cool until ginger snaps are hard again (about 10 minutes). Combine the smoked ginger snaps, brown sugar and melted butter in a food processor and process into moist crumbs. Spoon the crumbs into a 9-inch (6 cup capacity) pie pan and press the crumbs into the bottom and sides of the pie pan to form the crust. Return the crust to the grill on a baking sheet for easier handling and allow the crust to cook over indirect medium heat (350 degrees) for 10 minutes. Remove and allow to cool slightly (about 10-15 minutes). While the crust is cooling, prepare the filling. In a large mixing bowl whisk together the pumpkin puree, sweetened condensed milk, and spices until fully combined. Add the eggs and whisk into the pumpkin mixture. Pour the filling into the crust. Place a pie crust protector or piece of foil around the exposed crust (the edge of the pie pan) to prevent darkening. Return the pie to the grill (still on a baking sheet) to cook indirectly for 60 minutes or until a knife inserted an inch into the center of the pie comes out clean. Note: should the pie begin to develop darkened spots, tent the pie with a piece of heavy foil. Once the pie has cooked fully, allow it to cool on a rack before cutting and serving. This recipe and a portion of this post were originally created as a request Guest Post on Steven Raichlen’s ‘Barbecue! Bible’ website which can be viewed here. I am fond of cooking a scrumptious homemade pumpkin pie, with a tender, flaky crust. Everybody loves this recipe! WOW!! What a flavor combination!! We just went apple and pumpkin picking this weekend, so this recipe couldn’t have come at a better time. So adding this to my fall recipes list! I’m pretty sure this one doesn’t just taste amazing but smells amazing as well. 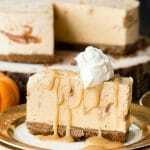 I think it’s really nice and it’s an awesome twist to the traditional pumpkin pie recipe! I love it. Oh that crust does sound really good! I like that hickory twist! Wow! This is a clever idea. I want to make this for our Halloween party for the whole family. This recipe looks so delicious. I am excited to give it a try. I will have to get the ingredients I need this week. This looks and sounds delicious! It would be great for Thanksgiving (or anytime, really)! Such an awesome pumpkin pie dessert. I really like the idea of making a ginger snap crust. This looks so decadently DELISH!! 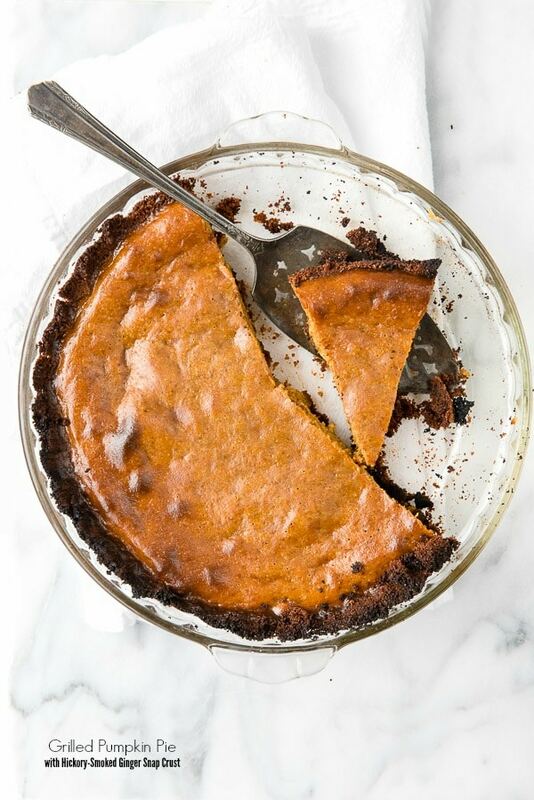 That ginger snap crust is just like the icing on the pie! Can’t wait to try this! Sounds really interesting! I’ve never tried anything with pumpkin in it before so this would be something to try for sure! I know my husband would love it! What a creative spin on a traditional pumpkin pie! I am sure incorporating the grill gives the pie an added layer of smoky depth. I’ve never tried grilling a pie before! This would be great for states that stay warm year round! Actually Kita I grill year round. It smells fantastic when grilling in the snow I’ve found! I have been using a similar recipe for my pumpkin pie loving gluten free grandson, only in the oven…had not thought of using the grill for this, what a great idea! Mind blown. I never even thought about grilling a pie! 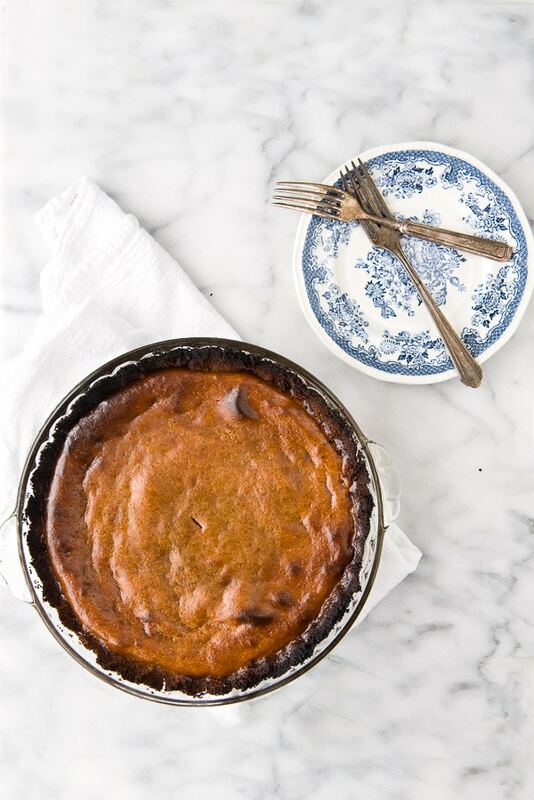 It looks and sounds delicious, especially that gingersnap crust! Oh, and my hubby will tell you that you can never have too many grilling tools. Yum! This looks so good! 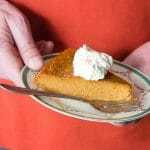 My hubby loves pumpkin pie, so I know he will enjoy this recipe. I don’t have any grilling game either. I would have never thought to make pumpkin pie on the grill! It’s easy Pam, that’s why I did it LOL! It’s really good too. Pumpkin pie is one of my favorite desert foods ever! I love that you used a Ginger Snap crust. That sounds amazing! Pumpkin pie is my favorite, and I’ve never heard a recipe quite like this before. Yummo! Pumpkin pie is a wonderful dessrt fpr children who don’t eat pumpkin porridge. It contains many vitamins and I will cook this pie according to your recipe. Thanks!